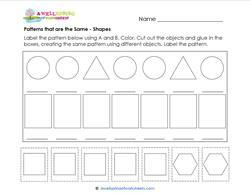 Patterns that are the same is a concept that may be off the beaten path, but from what I’ve seen, kindergarteners seem to have a fairly fun time coloring, cutting, and gluing different objects to create identical patterns. Children also label the patterns using A, B, & C which is a big plus in keeping those cut out pieces organized. 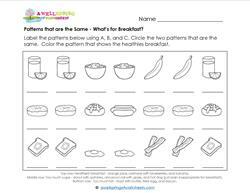 Check out these worksheets and find the one with a quiz about what makes a good breakfast! Label the pattern using A and B. Color. Cut out the objects and glue in the rectangles, creating the same pattern using different objects. Label. 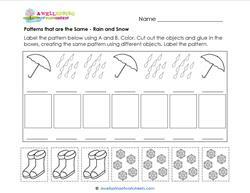 In this patterns that are the same worksheet, label the pattern using ABC. Cut out the shapes and glue creating the same pattern using different shapes. Label. Patterns That Are The Same – What’s for Breakfast? Label the patterns using A, B, and C. Circle the two patterns that are the same. Color the pattern that shows the healthiest breakfast.